View cart “Contemporary Oak Folding Console/Side Or Low Square Dining Table” has been added to your cart. 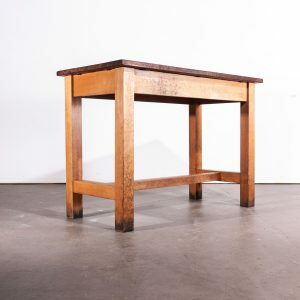 1950’s vintage high laboratory work/dining table or kitchen island table. Dating from the 1950’s this is a well used high work table from a school laboratory. As solid as a rock, made from solid Iroko with a (later) quirky storage rack fitted underneath (this can be removed if required) and a bottom storage shelf. The top has an exceptional patina having still retained its original oiled finish. A practical bar height table great with raised chairs/stools and perfect as a raised kitchen island unit. Please note the top has a very gentle upwards bow which can be seen in the photographs. Our workshop team inspect every product and carry out any needed repairs to ensure that everything leaves us serviced and maintained ready for many more years of life. All of our vintage products show the rich beauty and history of their life with the knocks and bumps of many years of use and we try to minimise restoration to keep every piece as original as possible.